Osun State Governor, Rauf Aregbesola has denied reports that one of his sons has been arrested for money laundering. The Director, Bureau of Communication & Strategy, Office of the Governor, Mr Semiu Okanlawon in a statement on Wednesday said the allegation that Governor Aregbesola’s son was arrested at Muritala Mohammed Airport by security agents on account of money laundering was untrue. The clarification was made by Aregbesola on Wednesday, May 13, through a statement released by his media aide, Semiu Okanlawon. Mr Okanlawon’s statement read in part, “It has become pertinent to inform Nigerians and others generally that there is no iota of truth in the story being peddled around by some misguided elements claiming that a son of Governor Rauf Aregbesola of Osun, Kabir Aregbesola was arrested at the Muritala Muhammed International Airport in Lagos on Tuesday May 12, 2015 with a huge sum of money in foreign currencies”. “We have discovered the authors of the wicked and malicious lie are doggedly pursuing their agenda by engaging in an aggressive push for the falsehood to reach a larger population especially using the social media. 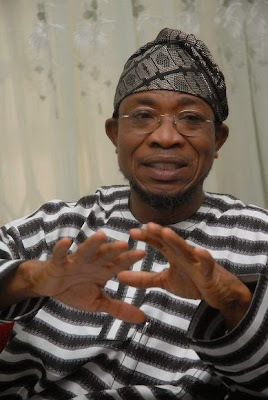 “The younger Aregbesola neither traveled anywhere nor had any encounter with any security personnel today. It is obvious the evil minds at work are out to drag an innocent young man’s name into this dirt in order to get at his father. “Obviously, part of the game plans of those behind this orchestrated lie is to whip up sentiments especially among the workers in Osun whose salaries are being delayed as part of the fallout of the national revenue crisis and demonise the governor. “Aregbesola has maintained a life of a moderate family man with a set of highly disciplined children who cannot be found wanting on issues of morals and societal values. “Members of the public are therefore urged to dismiss the falsehood because it is just another handiwork of mischievous minds”, he added.